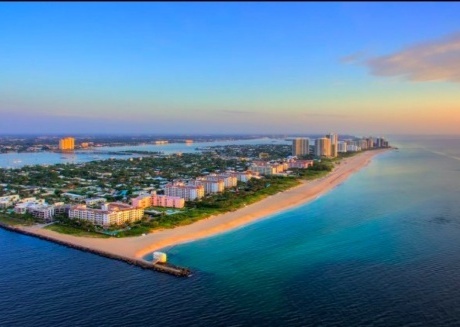 As the name indicates, West Palm Beach is a beautiful city located to the west of Palm Beach and is right beside it. Palm Beach is present on a barrier island in Florida across the Lake Worth Lagoon. West Palm Beach has a tropical rainforest climate which makes it the ideal holiday destination in the region. There are vast wetlands that provide recreational opportunities and the chance to observe rich wildlife in its natural habitat. People who are looking to escape the cold and war themselves up in Florida may consult CuddlyNest for vacation rentals in West Palm Beach. There is a wide range of accommodations especially stunning villas where you may stay with your friends, family or coworkers. Not only is the scenery breathtaking but you may avail all modern facilities on your trip such as wireless internet, home appliances, air conditioning and even swimming pools. Check out the child-friendly villas in West Palm Beach for rental if you are travelling with children. Visitors are always mesmerized by the natural beauty of this city particularly the amazing beaches and islands nearby. There are water parks where you may have fun on hot days with the whole family. Spend the day eating at the first class restaurants while shopping at the hottest outlets in West Palm Beach. There are museums and gardens to awe you and safaris which are not to be missed during your trip. The highlight of your stay at West Palm Beach might be a visit to the Manatee Lagoon which serves to educate people about the fascinating manatees and ecosystem of Lake Worth Lagoon. This is important because nearly all species of this marine mammal are endangered due to hunting. You may sign up for Sunday Lectures, tours, Junior Aqua Labs, yoga classes, ocean-themed painting for children, photography exhibitions and story time. There are field trips to promote manatee welfare as well. They also have a designated space for meetings and conferences. Among the people who had a major hand in developing Florida as a tourist destination was Henry M. Flagler. His house in West Palm Beach is now a museum and is popular for its neoclassical Beaux Arts architecture. It was designed by the renowned firm Carrère and Hastings. It was named Whitehall and built for his third wife. Today, it is a National Historic Landmark. You may learn about Henry Flagler and his work along with Florida’s railways and the unique architecture of Whitehall through tours. Permanent and travelling exhibits are arranged each year. Whitehall is open for private and corporate events as well. This is the best spot to enjoy snorkeling in Florida so you must visit Peanut Island on your trip to West Palm Beach. Maybe you don’t want to get wet. In that case, Peanut Island has 20 campsites where you may erect tents for the day. Kayaking is also a major tourist attraction on this island. Funnily enough, it was named so because it was initially meant to be a shipping point for peanut oil. This man-made island was created in 1918 and consists of an 80-acre county park today. It’s perfect for setting up picnics and going for boat rides with your family. This is a protected area in Florida that preserves the natural habitat and demonstrates how humans can coexist with the local wildlife without destroying the ecosystem. There are several on-going programs that help promote wildlife conservation in West Palm Beach. Visitors can go swimming or snorkeling in the ocean. There are also arrangements for kayaking along with lessons related to recreational skills. You may plan a picnic on the beach with your friends or attend one of the many live concerts taking place in John D. MacArthur Beach State Park. There are nature trails as well as a children’s playground. Worth Avenue is a popular resort destination in West Palm Beach which happens to a shopper’s Paradise with its world class shopping experience. You may buy everything from designer wear to home furnishings. Treat yourself to a luxurious vacation with Worth Avenue’s elite hotels that are fit for royals. Enjoy the finest food from around the world and get a taste of local cuisine at the restaurants there. You get the best of high life right next to the glorious beaches and unforgettable sunsets of West Palm Beach. Spend a relaxing day in the fragrant Mounts Botanical Garden at West Palm Beach that offers tours for visitors educating them on the magnificent seasonal blooms of Florida. They have academic programs for adults as well as children. Get to know all about the gardening of various floral species in the region from leading experts. There is a well maintained nursery from where you may purchase fresh saplings for your garden that are hard to find in other places. Children and adults alike will be thrilled for the Lion Country Safari that is the only drive through Safari in Florida. There are 300 acres of untouched land to explore and around 1000 native animal species to discover on your own. Under the supervision of the caretakers, you will be able to feed the animals and see them up close. Children can learn more about them in a fun interactive environment where animals are free to roam and thrive. Lion Country Safari has own awards and titles for its dedication to rehabilitation and promotion of tourism. People who cannot get enough of shopping may head over to Clematis Street, City Place, Palm Beach Outlets, Antique Row and Northwood Village. In addition to shopping, there is music, history and culture to enjoy. Are you ready to visit West Palm Beach? Start planning your trip with CuddlyNest so you may book the best vacation rental in the city according to your particular needs.